Millies page my stable mate. Welcome to my page on my stable mates web site. 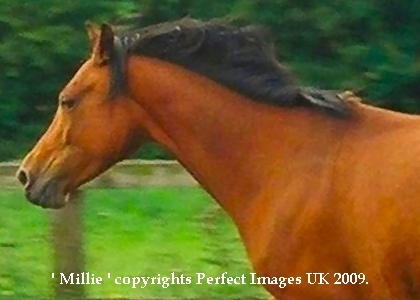 I was foaled on the 6th May 1998 and my stud reference is PBAR V38. I was bred by Mrs H Horley in Cheshire and I am a Part-Bred Arab Bay Mare with Warmblood and Thoroughbred Lines in my family. My Father is Netherburn Lyric and my Mother is Cherie and I am 16.6% registered with the Arab Horse Society. After weaning I was sold to my first owner who did not really do much with me regarding schooling so my life until Mr Smith purchased me was really spent 99% of the time in a field eating grass for 5 years. I really love grass and if it it was left to me I would be on the grass all the time. The Smith family purchased me and to be honest they did not really have any relevant information regarding me. I was sold as a horse to be brought on or to make a good Brood Mare. It was not long before the Smith's realised I had many issues and behaviour problems. Some of the problems I had were > I would not be bitted, I liked to bite, I could not be mounted and I had no real manners and no respect for humans. Basically I was really wild and just wanted to eat grass. For the next 4 years I had many problems and it looked like my Dad was going to give me up and make me a brood mare but he persisted and finally broke me at the age on Nine to saddle. I now hack out and I am 150% in traffic, good to catch and shoe but when in season I really am a very Moody Mare and will not let anyone back me. I also do not load very well but most recently I have decided to give it a go. My family have been really understanding with me and my training is always on-going and if the Smiths had not found me I really do wonder what would of become of me. I have a fantastic home and the best care any equine could have but I wish I could tel my family my real past from weaner to five years old???? My Dad plans to get me to the show ring under saddle and In-Hand has I have beautiful paces and superb ground manners but this will only happen if I continue to come good. I am on Ostress all year to help with my seasons but my Dad is considering inserting marbles into my reproduction system so I think I am in foal ' this would then hopefully correct my issues but it will be at the last resort ' My Dad does plan to put me in foal and breed sport horses with me but he really does not want to do this until I am around 13 / 14 years old has he really does feel I have very good show career ahead of me if I can get over my issues. Please come back soon to see my progress and dont forget to visit Rififi's Photo Gallery to see new pics.